The left part of the image shows what scientifically proven hypoxic training looks like. You wear a mask with an exogenous supply of low oxygen air. The right part of the image shows you what the fitness industry will try to sell you as "hypoxic training". That being said, did you know that at least the left version could also help you shed 11%% of your body fat in three weeks (learn more)? Based on the feedback I got on the mini-summary of the latest review on "Kaatsu" aka blood flow restricted training I posted as part of last Monday's Exercise Science Round Up, I gather that many of you will be interested to hear about the results of a pertinent experiment that has been conducted only recently at the Lincoln University in Christchurch; New Zealand (Manimmanakorn. 2013). 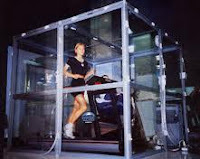 To elicit, whether a combination of resistance training and vascular occlusion would modify the patterns of muscle activation, the development of muscle strength and hypertrophy, and whether these effects could be replicated by training under hypoxic conditions, the scientists who were involved in this research recruited 30 female netballers (age 20.2 ± 3.3 years, height 168.4 ± 5.8 cm; body mass 65.2 ± 6.5 kg, mean ± SD). In the course of the 5-week training period the participants completed three training sessions per week. Each training session consisted of three sets of knee extensions followed by three sets of knee ﬂexions to failure (unable to complete the exercise successfully). The total number of sets was thus six, with 30s rest between sets and 2-min rest between exercises and a TUT (time under tension) of 1 0 1, which means that the women performed the exercise with a 1s concentric, 0 seconds rest at the top and a 1s eccentric contraction. "Building strength with 20% of the 1-RM? You are kiddin' me, right?" As you can see in figure 1 the hypoxia training turned out to be the most effective if training methods - at least, if we go by the absolute increases in maximal voluntary contraction. The difference to the Kaatsu condition, however was trivial for all three parameters: The MVC3, the MVC30 and the total number of reps at 20% of the 1-RM. The gym of the future a torture chamber or just an "old-school" gym in the basement? Whether the gyms of the future will hand out cuffs at the door or "simply" have a low oxygen environment... wait a second: Now I know why all the strong guys train in these non-air-conditioned old-school gyms. It's to create a hypoxic environment, one of which the researchers say that it furthers "substantial increases in strength and endurance", which were "undoubtedly" brought about in part due to increased skeletal muscle hypertrophy. Unfortunately, the actual increases in muscle cross sectional area (CSA) were not measured in the study at hand, but based on the findings of previous studies, which did report (in some cases) pretty impressive increases in CSA (see image next to the citation for one impressive example), I guess the scientists assumption that the ladies in the hypoxia and Kaatsu groups will also have gained more muscle than their peers is more than plausible. Bottom line: Now, let's get back to the "gym of the future" - I am not yet convince that we are soon going to see the air being sucked out of the gyms, but I am more and more convinced that blood flow restriction, Kaatsu, vascular occlusion or whatever else you may be using to reduce the oxygen supply to the muscle and thus increase the amount of eu-stress (=beneficial stress, learn more), will probably become the "intensity technique" of the future - if not on a "whole gym level", then maybe in form of one or two of those neat cages (see image at the bottom of the article). Whatever the future may hold, I still feel that it is very unlikely that Katsuu and hypoxic training with light weights are ever going to replace "regular" strength training completely. After all, working out should be more to you than just a means to develop sleeve bursting biceps. Honestly, if you seriously can say for yourself that you would not miss lifting heavy weights and would willingly content yourself with the knowledge that you should be able to do that, it's no wonder that you are clutching to any straw to finally make those gains you have been chasing for years. Kaatsu training on methodological dope: Where is the level playing ground?" You should also keep in mind that neither the study at hand, nor the previously mentioned and unquestionable impressive study by Takarada offered a level playing ground for the contestants, i.e. 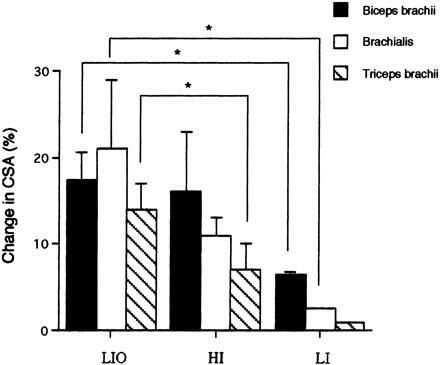 classic hypertrophy vs. Kaatsu or training in hypoxic conditions. ... ah, and I don't have to mention that not having a high intensity group in the Manimmanakorn study reminds me of those sponsored pre-workout supplement studies, here the placebo is either plain water or simple sugar - when you want to prove something is superior to common practice you better test it against common practice or your data is of highly questionable practical value. Manimmanakorn A, Manimmanakorn N, Taylor R, Draper N, Billaut F, Shearman JP, Hamlin MJ. Effects of resistance training combined with vascular occlusion or hypoxia on neuromuscular function in athletes. Eur J Appl Physiol. 2013 Feb 15. Takarada Y, Takazawa H, Sato Y, Takebayashi S, Tanaka Y, Ishii N. Effects of resistance exercise combined with moderate vascular occlusion on muscular function in humans. J Appl Physiol. 2000 Jun;88(6):2097-106.